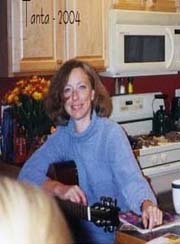 The FDIC closed seven more banks on Friday, and that brings the total FDIC bank failures to 106 in 2009. 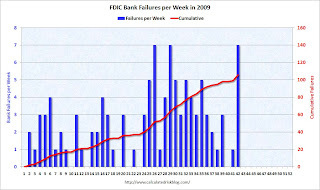 The following graph shows bank failures by week in 2009. Note: Week 1 on graph ends Jan 9th. After a busy summer, the FDIC slowed down in late September and early October with only five bank failures in four weeks. Perhaps the pace is about to pick up again. 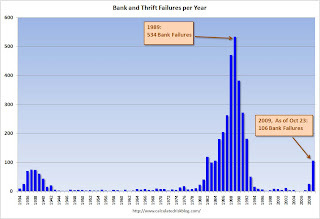 With 10 weeks to go, it seems 130 or so bank failures is likely this year. The 2nd graph covers the entire FDIC period (annually since 1934). This is the most failures per year since 1992 (181 failures). As far as failures per week - there were 28 weeks during the S&L crisis when regulators closed 10 or more banks, and the peak was April 20, 1989 with 60 bank closures (there were 7 separate weeks with more than 30 closures in the late '80s and early '90s). For a graph that includes the 1920s and early '30s (before the FDIC was enacted) see the 3rd graph here. Of course the number of banks isn't the only measure. Many banks today have more branches, and far more assets and deposits. Also the cumulative estimated losses for the DIF, since early 2007, is now about $45 billion. The pre-FDIC data is here.